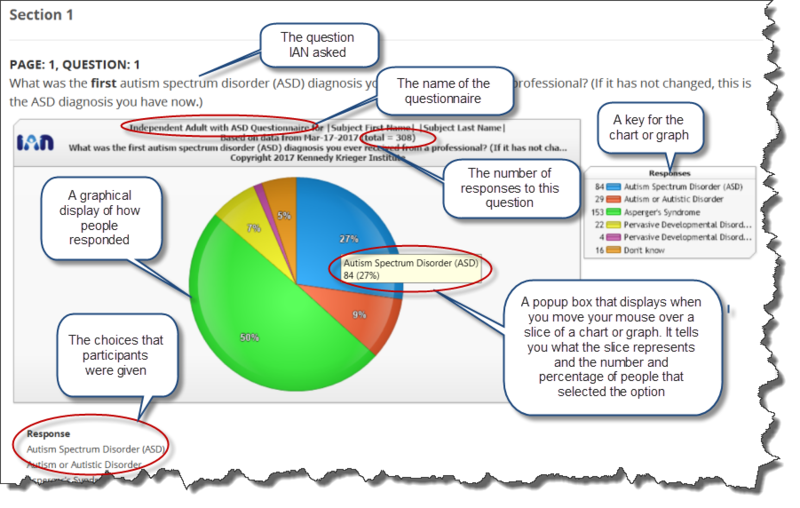 IAN’s Survey Results Viewer allows you to view charts and graphs of the results of some of the surveys that families and individuals with autism spectrum disorder (ASD) completed as participants in IAN Research. Please use a desktop or laptop computer because the charts and graphs will not display when you use a tablet or mobile device. We base the information displayed in the charts and graphs on the data that is in our database at the time that you use the Viewer. Because we do not clean up the data the way that we do when we use it for a scientific analysis, you may see some charts and graphs that contain some odd results. The charts and graphs show responses to individual questions and do not attempt to summarize data on complex issues. Before presenting any information through the Viewer, we aggregate the data and remove any information that might tie that information to an individual. If there are too few responses (less than 250) to a specific question or survey, the Viewer displays a message rather than the results. We base the charts and graphs on information submitted online to IAN Research by volunteers who are adults with autism spectrum disorder (ASD) or parents of children with ASD. Because we use a volunteer population that has participated in online self-report research, the information may contain biases and may not always represent the population. Visit IAN’s Survey Results Viewer. At the top of each survey report you will see the name of the survey and the instructions that the participants saw when they were taking the survey. Next, we display the charts and graphs for each question. Figure 1, below, describes the information given for each questions. In many questions, you will see the text: |Subject First Name||Subject Last Name|. This is a placeholder for the name of the person who the question pertains to. The chart or graph shows how people responded to the question. You will also see the total, which tells you how many people responded to the question. This number is often different than the number of people who participated in the research, because questions pertain to different people and people sometimes skip questions. To view our codebook in addition to the charts and graphs, select Researcher View. If you would like to use IAN data for your research, learn about our data services.